NO PURCHASE NECESSARY TO ENTER OR WIN A PRIZE IN THIS SWEEPSTAKES. A PURCHASE WILL NOT INCREASE YOUR CHANCES OF WINNING. VOID WHERE PROHIBITED BY LAW. EACH WINNER WILL BE REQUIRED TO RESPOND TO WINNER NOTIFICATION AND OTHER COMMUNICATIONS FROM SPONSOR (DEFINED BELOW) WITHIN SEVENTY-TWO (72) HOURS ACCORDING TO THE NOTICE(S) FROM SPONSOR OR PRIZE MAY BE FORFEITED (IN SPONSOR’S SOLE DISCRETION). THIS SWEEPSTAKES IS IN NO WAY SPONSORED, ENDORSED OR ADMINISTERED BY, OR ASSOCIATED WITH FACEBOOK, INC. (“FACEBOOK”) OR INSTAGRAM, LLC (“INSTAGRAM”). BY ENTERING THIS SWEEPSTAKES, YOU AGREE TO THESE OFFICIAL RULES, WHICH ARE A CONTRACT, SO READ THEM CAREFULLY BEFORE ENTERING. WITHOUT LIMITATION, THIS CONTRACT INCLUDES INDEMNITIES TO THE SPONSOR FROM YOU, A LIMITATION OF YOUR RIGHTS AND REMEDIES, BINDING ARBITRATION OF CLAIMS, WAIVER OF CLASS ACTION CLAIMS, AND WAIVER OF THE RIGHT TO TRIAL BY JURY. 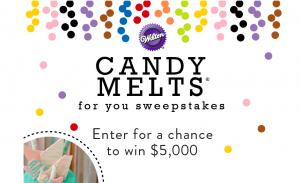 OVERVIEW: The Wilton Candy Melts Photo Sweepstakes (“Sweepstakes”) is sponsored by Wilton Industries, Inc. (“Sponsor”). The Sweepstakes begins at 12:00:00 p.m. Central Time (“CT”) on October 15, 2017, and ends at 11:59:59 p.m. CT on December 31, 2017 (“Sweepstakes Period”). If you satisfy the eligibility requirements (described below), you may enter the Sweepstakes via Instagram or Facebook (referred to collectively, or when a distinction is not necessary, as “Social-Media Platform(s)”) by taking a photograph of a project created with Wilton’s Candy Melts candy (a “Photo”) and posting that Photo from your Instagram account with the Required Tag (see below for “Required Tag”) or posting a comment on the Sweepstakes Post (defined below) that includes your Photo and the Required Tag; or to enter without posting a Photo by completing a Sweepstakes Entry Form at www.wilton.com/candymeltsforyou. See below for important Submission Requirements for Photos. Following the conclusion of the Sweepstakes Period, Sponsor will select thirty one (31) winners through a random drawing from among all eligible entries received in this Sweepstakes. Participation in this Sweepstakes constitutes entrant’s full and unconditional agreement to and acceptance of these Official Rules and the decisions of Sponsor. ELIGIBILITY: This Sweepstakes is open only to legal residents of any one (1) of the fifty (50) United States or the District of Columbia and Canada, excluding Québec (collectively, the “Territory”) who are at least eighteen (18) years old and the age of majority in their primary jurisdiction of residence as of the date of entry. The Territory does not include Puerto Rico, Guam, U.S. Virgin Islands and the U.S. Territories and Possessions, or Québec. Those who enter by a Social-Media Platform must be registered users of the Social-Media Platform that they use to enter and be and remain in good standing throughout the Sweepstakes Period and prize fulfillment process. Corporate entities are not eligible and have no right to claim any prize won by their employees. Employees, officers, members, directors, managers, agents, and representatives (including, without, limitation, Wilton Method Instructors) of Sponsor and its parent companies, owners, subsidiaries, divisions, successors in interest, corporate partners, and affiliated companies, any promotion, advertising, or public relations company doing business with any of the above (collectively, along with Facebook and Instagram, the “Released Parties”), or a member of the immediate family (parent, children, siblings, spouse, domestic partner regardless of where they live) or any individual living in the same household of such employees (whether related or not) are not eligible. This Sweepstakes is void outside of the Territory and where prohibited by law. To enter via Facebook or Instagram, first take a Photo of your project that was created with Wilton’s Candy Melts candy. The Photo must comply with these Official Rules, including the Submission Requirements set forth below. Once you have created your Photo, you may enter this Sweepstakes by posting your qualifying Photo, along with CandyMeltsForYouSweepstakes” (“Required Tag”) , on your choice of Facebook or Instagram as follows: (each, an “Entry Post”). Via Instagram. By logging into your account on Instagram and posting your Photo along with the Required Tag. Adding the Required Tags to an image previously posted on Instagram will not earn an entry in this Sweepstakes. Via Facebook. By logging into your account on Facebook, finding the official Sweepstakes announcement post on Sponsor’s official Wilton Cake Decorating Page, available at https://www.facebook.com/wilton.cake.decorating (“Sweepstakes Post”), and posting a comment on the Sweepstakes Post that includes your Photo and the Required Tag. Your Entry Post must be posted during the Sweepstakes Period to be eligible in this Sweepstakes. Sponsor may, in its sole discretion, void any purported entry and/or disqualify you if you do not include the Required Tag when posting your Entry Post. In posting your Entry Post, you may have the opportunity to publicly post text or other user-generated content in addition to your Photo (collectively, with your Photo, your “Entrant Content”). All Entrant Content you submit, post, or otherwise distribute in connection with this Sweepstakes must comply with the “Submission Requirements” detailed in that section below and otherwise comply with these Official Rules. By posting an Entry Post you are agreeing to these Official Rules. All Entrant Content must comply with these Official Rules (including, without limitation, the Submission Requirements section below) and the Terms of Service for the Social-Media Platform you used to enter (Instagram: http://instagram.com/about/legal/terms/ and Facebook: https://www.facebook.com/terms). Your Entry Post will not be deemed an entry in the Sweepstakes until Sponsor verifies that it meets all the Submission Requirements detailed below; but the substantive content of the Entry Post will not otherwise affect your chances of winning (provided your entry otherwise complies with these Official Rules). Sponsor is not responsible for misspellings, typographical errors, or other issues that may affect the ability of Sponsor to locate a purported Entry Post using a search to find eligible entries. Sponsor may not be able to view purported Entry Posts, receive or send communications, or otherwise detect participation from or interact with entrants who have account settings within their chosen Social-Media Platform that make their updates, comments, posts or communications private, protected, or otherwise limited due to the way the Social-Media Platforms operate their respective services. Sponsor may not be able to communicate with a participant via some of Instagram’s features if participant does not “follow” Sponsor’s @wiltoncakes account on Instagram. No entrant is required to follow any Sponsor account on any of the Social-Media Platforms and may discontinue following Sponsor or having an account on any Social-Media Platform at any time, but doing so may mean that Sponsor cannot receive or provide communications for purposes of administering this Sweepstakes, which could result in entrant being disqualified and ineligible to win a prize. It is each participant’s responsibility to set his or her account settings on the applicable Social-Media Platform to ensure that any purported Entry Post is made publicly, to accept contacts by Sponsor, and to timely check his or her account for any comments, @replies, messages, direct posts, or other communications (as applicable) from Sponsor. Sponsor is not responsible for changes to any functionality or policy of a Social-Media Platform (or any website or mobile application offered as part of such Social-Media Platform) that may interfere with the Sweepstakes or ability of an entrant to timely enter or otherwise participate at all. Entry Posts that are not both actually visible and timely received by Sponsor will not be entered into this Sweepstakes. Entrant’s Entry Post must remain visible to Sponsor throughout the award of the prize in this Sweepstakes and Sponsor may, in its sole discretion, disqualify any entrant whose Entry Post is removed or otherwise made invisible to Sponsor prior to such time. Sponsor, at its sole discretion, may accept or disqualify any purported Entry Post that omits or contains a technically incorrect variation of the Required Tag. Purported Entry Posts that are incorrect or incomplete, received outside the Sweepstakes Period, or contain obscene, offensive, or any other language or imagery communicating messages inconsistent with the positive images with which Sponsor wishes to associate itself (all as determined by Sponsor in its sole discretion) will be void. Eligible individuals can also visit www.wilton.com/candymeltsforyou (“Sweepstakes Site”) and follow the on-screen links and instructions to complete and submit the Sweepstakes entry form during the Sweepstakes Period. For purposes of this Sweepstakes, an entry via this method is earned when the Sponsor’s website servers record a completed entry with all required information. Limit one (1) entry per person, irrespective of Entry Method. Subsequent attempts made by the same individual to submit multiple entries in violation of this condition by any methods or means are void and persons engaging in such conduct may, in Sponsor’s sole discretion, be disqualified. Normal Internet access and usage charges imposed by your Internet Service Provider may apply. Entries must be submitted and received by Sponsor during the Sweepstakes Period through one of the approved Entry Methods and in strict accordance with the instructions and restrictions in these Official Rules. For purposes of this Sweepstakes, an Entry Post is “received” when the applicable Social-Media Platform records your Entry Post and it is visible to Sponsor or for Entries submitted through the Sweepstakes Site, when the completed Entry is actually recorded on the Sweepstakes Site’s servers during the Sweepstakes Period. Other proof of submitting or attempting to submit an entry (such as, without limitation, a screenshot of your purported Entry Post on one of the Social-Media Platforms or Sweepstakes Site ) does not constitute proof of actual receipt of the entry for purposes of this Sweepstakes. Those who do not abide by these Official Rules or the instructions of Sponsor or its representatives and provide all required information may, in Sponsor’s sole discretion, be disqualified and any entry by such person void. Entries that are fraudulent, forged, altered, incomplete, lost, late, misdirected, mutilated, illegitimate, incomprehensible, garbled, or generated by a macro, bot, or other automated means will not be accepted and will be void. Entries or participation made by you on behalf of any other individual or any entity or group, made by another on your behalf, or originating at any online service other than one of the approved Social-Media Platforms (including, without limitation, through a commercial promotion subscription, notification, or entering service) will be declared invalid and disqualified for this Sweepstakes. As a condition of entering the Sweepstakes, without limiting any other provision in these Official Rules, each entrant gives consent for Sponsor and its agents to obtain and deliver his or her name, address, and other information and content to third parties for the purpose of administering this Sweepstakes and complying with applicable laws, regulations, and rules. YOU SHOULD RETAIN A BACK-UP COPY OF YOUR PHOTO AND ANY OTHER ENTRANT CONTENT YOU SUBMIT. ANY ENTRY OR ENTRANT CONTENT THAT DOES NOT CONFORM TO THE REQUIREMENTS IN THESE OFFICIAL RULES MAY, IN SPONSOR’S SOLE DISCRETION, BE DEEMED INELIGIBLE. Photo must be a still image, not a video or gif. If your Entrant Content depicts or mentions any identifiable person other than you, you agree that (a) such person is 18 years old or older and the age of majority in his or her state of residence and you have that person’s approval to include his or her name, likeness, or image in the Entrant Content and submit it in this Sweepstakes and can provide Sponsor proof of that approval in writing upon Sponsor’s request and within the timeframe requested or (b) such person is your own minor child or ward and you are capable of granting such approval on behalf of him or her. All aspects of the Entrant Content must be originally created by and solely owned by you (or be in the public domain). Except for materials in the public domain, all third-party content and content unoriginal to you is prohibited. Entry Post must include the Required Tag: #CandyMeltsForYouSweepstakes. Entrant Content must comply with the Terms of Service for the Social-Media Platform that is used for entry. Entrant Content must not create or imply any association between Sponsor and any individual or entity or his, her, or its products or services. Entrant Content must not contain any commercial or corporate advertising (including, without limitation, corporate logos, brand names, and slogans), recognizable branded products, or commercial artwork other than those of Sponsor that are contained in the Required Tags or may be otherwise incorporated into your Entrant Content. Entrant Content must not infringe, misappropriate, or violate any rights of any third party including, without limitation, copyright (including moral rights), trademark, trade secret, or rights of privacy or publicity. Entrant Content must be unpublished and not have been submitted in any other contest, promotion, or competition. Entrant Content must not include information or content that is false, fraudulent, deceptive, misleading, defamatory, slanderous, libelous (including trade libel), disparaging, unlawfully harassing, threatening, profane, obscene, pornographic, hateful, indecent, inappropriate, or injurious to any Released Party or any other party. Entrant Content must not contain or describe any harmful or illegal activity or content or in any way violate any federal, state, provincial, or local laws, rules, or regulations. Entrant Content must not suggest, depict, or describe any inappropriate, unlawful, or dangerous behavior or use of Sponsor’s or any other products or services. You agree that your participation in the Sweepstakes and agreement to these Official Rules and any Released Party’s display and use of the Entrant Content permitted under these Official Rules will not violate any agreement to which you are a signatory or party. To the fullest extent permitted by applicable law, you agree to indemnify the Released Parties against any and all claims from any third party for any use or reuse by any Released Party of the Entrant Content permitted under these Official Rules. Sponsor reserves the right in its sole discretion to disqualify from the Sweepstakes any entrant whose Entrant Content refers, depicts, or in any way reflects negatively upon a Released Party, the Sweepstakes, or any other person or entity or does not comply with any provision of these Official Rules (including the above Submission Requirements), all as determined by Sponsor in its sole discretion. By entering, except where prohibited by law, each entrant grants to the Released Parties (and their agents, successors and assigns) the irrevocable, sublicensable, absolute and perpetual right and permission to use, edit, modify, copy, adapt, publish, and exploit the Photo and any other Entrant Content contained in an Entry Post in any and all media now existing or hereafter devised (including online) throughout the world, in any language, and in any manner for trade, advertising, promotional, commercial, or any other purposes, without further review, notice, approval, consideration, or compensation beyond the opportunity to win a prize in this Sweepstakes. Each entrant waives and releases the Released Parties from any and all claims that entrant may now or hereafter have in any jurisdiction based on “moral rights” or “droit moral” or unfair competition with respect to the Released Parties’ exploitation of any Entrant Content without further notification or compensation to entrant of any kind, and agrees not to instigate, support, maintain, or authorize any action, claim, or lawsuit against the Released Parties, each of their licensees, or any other person in connection with this Sweepstakes, on the grounds that any use of any Entrant Content or element thereof (including the Photo) or derivative works therefrom in accordance with this license infringes or violates any of entrant’s rights (including MORAL RIGHTS) therein. Each entrant hereby acknowledges and agrees that the relationship between the entrant and each of the Released Parties is not a confidential, fiduciary, or other special relationship, and that the entrant’s decision to submit his/her Entry Post for purposes of the Sweepstakes does not place any of the Released Parties in a position that is any different from the position held by members of the general public with regard to elements of the Entry Post (including the Photo), other than as set forth in these Official Rules. Each entrant understands and acknowledges that Sponsor has wide access to ideas, images, and other creative materials. Each entrant also acknowledges that many ideas or images may be competitive with, similar to, or identical to his/her Entry Post and/or each other in idea, components, format, or other respects. Each entrant acknowledges and agrees that such entrant will not be entitled to any compensation as a result of Sponsor’s use of any such similar or identical material that has or may come to Sponsor from other sources. Each entrant acknowledges and agrees that Sponsor does not now and will not have in the future any duty or liability (direct or indirect; vicarious, contributory, or otherwise) with respect to the infringement or protection of the entrant’s copyright in and to his/her Entry Post or its constituent elements. Each entrant acknowledges that, with respect to any claim by entrant relating to or arising out of a Released Party’s actual or alleged exploitation or use of any Entrant Content or other material submitted in connection with the Sweepstakes, the damage, if any, thereby caused to the applicable entrant will not be irreparable or otherwise sufficient to entitle such entrant to seek injunctive or other equitable relief or in any way enjoin the production, distribution, exhibition, or other exploitation of any Released Party property or product, and entrant’s rights and remedies in any such event are strictly limited to the right to recover damages, if any, in an action at law. ODDS AND WINNER SELECTION/NOTIFICATION: Thirty one (31) prize winners will be selected in a random drawing from among all eligible entries received. The drawing will take place within approximately five (5) business days of the close of the Sweepstakes Period Odds of winning a prize depend on the number of eligible entries received. Within approximately three (3) business days of the prize drawing, Sponsor will attempt to contact each potential winner. For those U.S. Entrants who entered via the Social-Media Platform Entry Methods Sponsor may use such the Social-Media Platform’s direct message features. In addition to the direct message, and for Canada Entrants who entered via the Social-Media Platform Entry Methods, Sponsor may also elect (but is under no obligation) to post a comment on the winning Entry Post instructing the potential winner to check his/her direct messages and/or to contact Sponsor through contact information provided in such comment. Entrants are encouraged to monitor their Social-Media Platform accounts for correspondence from Sponsor. If an entrant is not a follower of Sponsor’s @wiltoncakes account on Instagram, such entrant may have to affirmatively accept a direct message sent by Sponsor. For Entrants who entered via the Sweepstakes Site, Sponsor will use the email provided at the time of entry, or (in Sponsor’s sole discretion) through other contact information provided at the time of entry. The potential winner will be required to respond to Sponsor as instructed within seventy-two (72) hours of Sponsor contacting the potential winner. If any prize, prize notification, or Sweepstakes-related communication is rejected, faulty, or returned as undeliverable or if a potential winner does not respond according to the notification’s or Sponsor’s instructions or otherwise fails to comply with these Official Rules, the prize may, in Sponsor’s sole discretion, be forfeited and an alternate winner may be selected (time permitting). Upon prize forfeiture, no compensation will be given and Sponsor will have no responsibility or liability to that participant. To claim a prize, each potential winner must follow the directions in his or her notification. Sponsor reserves the right to modify the notification procedures in connection with the selection of an alternate potential winner, if any. Each potential prize winner may, in Sponsor’s sole discretion, be required to complete, sign, have notarized (if applicable) and return an Affidavit of Eligibility and Liability/Publicity Release (unless prohibited by law) and tax documents, if applicable (collectively, “Prize Winner Documents”) within the time frame specified and in the form provided by Sponsor, without revision, or prize may be forfeited. The Prize Winner Documents, if applicable, must be received by Sponsor within five (5) days of Sponsor sending the documents to the potential winner or other time frame as stated in the Prize Winner Documents, or prize may be forfeited and an alternate winner may be selected. The prize claim and Prize Winner Documents are subject to verification by Sponsor. The prizes, if legitimately claimed, will be awarded. Sponsor will not be obligated to pursue more than three (3) alternate winners (time permitting) for any prize for any reason, in which case that prize may go unawarded. Prize winners who reside in Canada must, in order to be declared an official prize winner correctly answer (unaided) a time-limited mathematical skill testing question administered by Sponsor. Additionally, both U.S. and Canada Prize Winners could be subject to U.S. withholding tax on their prize. Grand Prize: One (1) grand-prize winner, subject to verification, will receive a prize, which consists solely of five thousand U.S. dollars cash ($5,000USD or for a Canada Prize Winner, the comparable amount in Canadian dollars, based on the then-current exchange rate). ARV of the grand prize: $5,000 USD. Second Prize: ten (10) second-prize winners, subject to verification, will each receive a prize, which consists solely of five hundred U.S. dollars cash ($500USD or for a Canada Prize Winner, the comparable amount in Canadian dollars, based on the then-current exchange rate). ARV of each second prize: $500 USD, for a total ARV of all second prizes of ($5,000USD). Third Prize: twenty (20) third-prize winners, subject to verification, will each receive a prize, which consists solely of one (1) one hundred dollar ($100 or for a Canada Prize Winner, the comparable amount in Canadian dollars, based on the then-current exchange rate) Michaels gift card. ARV of each third prize: $100 USD, for a total ARV of all third prizes of ($2,000). Total ARV of all prizes: $12,000 USD. For cash prizes, Sponsor may distribute in the form of cash, check, prepaid card or any other form or method (in Sponsor’s sole discretion). All prize details not specifically stated in these Official Rules will be determined by Sponsor in its sole discretion. Gift cards are subject to additional terms and conditions as specified thereon (or in accompanying materials). All taxes (federal, state, provincial and local), as well as any expenses associated with prize acceptance and use and not specified in these Official Rules as being provided as part of the prize, are the sole responsibility of the winner. Mailed prize elements will only be mailed to a confirmed winner’s address in the Territory, unless otherwise agreed to by Sponsor. Please allow approximately 6-8 weeks for shipment. Sponsor is not responsible for and will not replace any lost, mutilated, or stolen prize or prize component, or any prize/prize component that is undeliverable or does not reach a winner because of incorrect or changed contact information. If a winner does not accept or use the entire prize, the unaccepted or unused part of the prize will be forfeited and Sponsor will have no further obligation with respect to that prize or portion of the prize. Sponsor is not responsible for any inability of any winner to accept or use any prize (or portion thereof) for any reason. Winners are strictly prohibited from selling, auctioning, trading or otherwise transferring any part of a prize, except with Sponsor’s permission, which may be granted or withheld for any reason in its sole discretion. No transfers, prize substitutions or cash redemptions will be made, except at Sponsor’s sole discretion. Sponsor reserves the right to substitute any stated prize or portion thereof with another prize or portion thereof of equal or greater value for any reason, including, without limitation, prize unavailability. No more than the stated prizes will be awarded. Sponsor shall not be held responsible for any delays in awarding any prizes for any reason. Entrants waive the right to assert, as a cost of winning any prize, any and all costs of verification and redemption or travel to claim the prize and any liability and publicity which might arise from claiming or seeking to claim said prize. TO THE FULLEST EXTENT PERMITTED UNDER APPLICABLE LAW, EACH ENTRANT AGREES TO RELEASE, HOLD HARMLESS, AND INDEMNIFY EACH OF THE RELEASED PARTIES FROM AND AGAINST ANY LIABILITY WHATSOEVER FOR INJURIES OR DAMAGES OF ANY KIND SUSTAINED IN CONNECTION WITH THE ACCEPTANCE, USE, MISUSE, OR AWARDING OF THE PRIZE OR WHILE PREPARING FOR, PARTICIPATING IN, AND/OR TRAVELING TO OR FROM ANY PRIZE- OR SWEEPSTAKES-RELATED ACTIVITY INCLUDING, WITHOUT LIMITATION, ANY INJURY, DAMAGE, LOSS, DEATH OR ACCIDENT TO/OF PERSON OR PROPERTY. THE LIMITATIONS SET FORTH IN THIS SECTION WILL NOT LIMIT OR EXCLUDE THE RELEASED PARTIES’ LIABILITY FOR PERSONAL INJURY OR TANGIBLE PROPERTY DAMAGE CAUSED BY THE RELEASED PARTIES, OR FOR THE RELEASED PARTIES’ GROSS NEGLIGENCE, FRAUD, OR INTENTIONAL, WILLFUL, MALICIOUS, OR RECKLESS MISCONDUCT. TO THE FULLEST EXTENT PERMITTED BY APPLICABLE LAW, EACH WINNER AGREES THAT THE PRIZE IS PROVIDED AS-IS WITHOUT ANY WARRANTY, REPRESENTATION, OR GUARANTEE, EXPRESS OR IMPLIED, IN FACT OR IN LAW, WHETHER NOW KNOWN OR HEREINAFTER ENACTED, RELATIVE TO THE USE OR ENJOYMENT OF THE PRIZE, INCLUDING, WITHOUT LIMITATION, ITS QUALITY, MERCHANTABILITY, OR FITNESS FOR A PARTICULAR PURPOSE. Released Parties are not responsible and/or liable for any of the following, whether caused by a Released Party, the entrant, or by human error: entries that are submitted by illegitimate means (such as, without limitation, by an automated computer program) or entries in excess of any stated limit; any lost, late, incomplete, illegible, unintelligible, garbled, mutilated, or misdirected entries, email, Social-Media Platform direct message, mail, or Sweepstakes-related correspondence or materials or postage-due mail; any error, omission, interruption, defect or delay in transmission or communication; viruses or technical or mechanical malfunctions; interrupted or unavailable cable or satellite systems; errors, typos, or misprints in these Official Rules, in any Sweepstakes-related advertisements, or other materials; failures of electronic equipment, computer hardware, or software; lost or unavailable network connections, or failed, incorrect, incomplete, inaccurate, garbled or delayed electronic communications. The Released Parties are not responsible for electronic communications that are undeliverable or otherwise not received or noticed by entrant as a result of any form of active or passive filtering of any kind (including, without limitation, Instagram or Facebook direct messages that require entrant to actively accept the message in order to access it), or insufficient space in entrant’s email or voicemail inbox to receive email or voicemail messages. Released Parties are not responsible, and may disqualify you, if your email address, Instagram handle, Facebook account, or other contact information does not work or is changed without prior written notice to Sponsor. Without limiting any other provision in these Official Rules, Released Parties are not responsible or liable to any entrant or winner (or any person claiming through such entrant or winner) for failure to supply a prize or any part thereof in the event that any of the Sweepstakes activities or Released Parties’ operations or activities are affected by any cause or event beyond the sole and reasonable control of the applicable Released Party (as determined by Sponsor in its sole discretion), including, without limitation, by reason of any acts of God, equipment failure, threatened or actual terrorist acts, air raid, act of public enemy, war (declared or undeclared), civil disturbance, insurrection, riot, epidemic, fire, explosion, earthquake, flood, hurricane, unusually severe weather, blackout, embargo, labor dispute or strike (whether legal or illegal), labor or material shortage, transportation interruption of any kind, work slow-down, any law, rule, regulation, action, order, or request adopted, taken, or made by any governmental or quasi-governmental entity (whether or not such governmental act proves to be invalid), or any other cause, whether or not specifically mentioned above. By entering the Sweepstakes (except where prohibited by law), each entrant grants the Released Parties the irrevocable, sublicensable, absolute right and permission to use, publish, post or display his or her name, photograph, likeness, voice, prize information, biographical information, city and state or province of residence, any quotes attributable to him or her and any other indicia of persona (regardless of whether altered, changed, modified, edited, used alone, or used with other material in the Released Parties’ sole discretion) for advertising, trade, promotional and publicity purposes without further obligation or compensation of any kind to him or her, anywhere, in any medium now known or hereafter discovered or devised (including, without limitation, on the Internet), worldwide, without any limitation of time, and without notice, review, or approval and each entrant releases all Released Parties from any and all liability related thereto. Nothing contained in these Official Rules obligates Sponsor to make use of any of the rights granted herein and winners waives any right to inspect or approve any such use. Sponsor’s decisions will be final in all matters relating to this Sweepstakes, including interpretation of these Official Rules, determination of the winners, and awarding of the prizes. All participants, as a condition of entry, agree to be bound by these Official Rules and the decisions of Sponsor. Failure to comply with these Official Rules may result in disqualification from this Sweepstakes. Participants further agree to not damage or cause interruption of the Sweepstakes and/or prevent others from participating in the Sweepstakes. Sponsor reserves the right to restrict or void online entries or participation from any Social-Media Platform account or other identifiable source if any suspicious entry and/or participation is detected. Sponsor reserves the right, in its sole discretion, to void entries of any entrants who Sponsor believes have attempted to tamper with or impair the administration, security, fairness, or proper play of this Sweepstakes. Sponsor’s failure to or decision not to enforce any provision in these Official Rules will not constitute a waiver of that or any other provision. In the event there is an alleged or actual ambiguity, discrepancy, or inconsistency between disclosures or other statements contained in any Sweepstakes-related materials and/or these Official Rules (including any alleged discrepancy or inconsistency within these Official Rules), it will be resolved by Sponsor in its sole discretion. Entrants waive any right to claim ambiguity in the Sweepstakes structure or these Official Rules. If Sponsor determines, at any time and in its sole discretion, that a winner or potential winner is disqualified, ineligible, in violation of these Official Rules, or engaging in behavior that Sponsor deems obnoxious, inappropriate, threatening, illegal or that is intended to annoy, abuse, or harass any other person, Sponsor reserves the right to disqualify that winner or potential winner, even if the disqualified winner or potential winner may have been notified or displayed or announced anywhere. The Released Parties are not responsible and will have no liability for any purported Entry Post or other content that is removed from a Social-Media Platform for any reason at any time, including removal by a Social-Media Platform of content that would otherwise qualify as an Entry Post in response to such content being “flagged” or reported as inappropriate. The invalidity or unenforceability of any provision of these Official Rules will not affect the validity or enforceability of any other provision. In the event that any provision is determined to be invalid or otherwise unenforceable or illegal, these Official Rules will otherwise remain in effect and will be construed in accordance with their terms as if the invalid or illegal provision were not contained herein. The Released Parties are not responsible for any changes to or unavailability of the Social-Media Platforms that may interfere with the Sweepstakes (including any limitations, restrictions, or conditions placed upon Sponsor’s ability to use a Social-Media Platform for the Sweepstakes as set forth herein that are not acceptable to Sponsor) or ability of entrant to timely enter, receive notices or communicate with Sponsor, in which case Sponsor, in its sole discretion, may terminate or modify the Sweepstakes. If the Sweepstakes is not capable of running as planned for any reason, Sponsor reserves the right, in its sole discretion, to cancel, modify or suspend the Sweepstakes and award the prizes from eligible, non-suspect entries received prior to cancellation, modification, or suspension or as otherwise deemed fair and appropriate by Sponsor. If any person supplies false information, obtains entries by fraudulent means, or is otherwise determined to be in violation of these Official Rules in an attempt to obtain any prize, Sponsor may disqualify that person and seek damages from him or her and that person may be prosecuted to the full extent of the law. In the event of a dispute concerning the identity of a participant, the participant will be declared to be the registered account holder of the email address associated with the Instagram or Facebook account used at the time of entry, but only if that person meets all other eligibility criteria, otherwise the entry may, in Sponsor’s sole discretion, be disqualified and any potential prize won forfeited. A registered account holder is defined as the natural person who is assigned to an email address by an Internet access provider, online service provider, or other organization (e.g., business, educational institution, etc.) that is responsible for assigning email addresses for the domain associated with the submitted email address. Winners may be required to show proof of being the registered account holder. If a dispute cannot be resolved to Sponsor’s satisfaction, in its sole discretion, the entry will be deemed ineligible. CAUTION: ANY ATTEMPT TO DAMAGE ANY ONLINE SERVICE OR TO UNDERMINE THE LEGITIMATE OPERATION OF THE SWEEPSTAKES MAY VIOLATE CRIMINAL AND CIVIL LAWS. IF SUCH AN ATTEMPT IS MADE, SPONSOR MAY DISQUALIFY ANY PARTICIPANT MAKING SUCH ATTEMPT AND MAY SEEK DAMAGES TO THE FULLEST EXTENT PERMITTED BY LAW. GOVERNING LAW/DISPUTES/ARBITRATION: YOU AGREE THAT THESE OFFICIAL RULES AND YOUR PARTICIPATION IN THE SWEEPSTAKES ARE GOVERNED BY THE LAWS OF THE STATE OF ILLINOIS. BOTH YOU AND SPONSOR WAIVE THE RIGHT TO A TRIAL BY JURY AND THE RIGHT TO BRING OR RESOLVE ANY DISPUTE AS A CLASS, CONSOLIDATED, REPRESENTATIVE, COLLECTIVE, OR PRIVATE ATTORNEY GENERAL ACTION. NOTWITHSTANDING ANY PROVISION IN THE JAMS (DEFINED BELOW) RULES TO THE CONTRARY, THE ARBITRATOR SHALL NOT HAVE THE AUTHORITY OR ANY JURISDICTION TO HEAR THE ARBITRATION AS A CLASS, CONSOLIDATED, REPRESENTATIVE, COLLECTIVE, OR PRIVATE ATTORNEY GENERAL ACTION OR TO CONSOLIDATE, JOIN, OR OTHERWISE COMBINE THE CLAIMS OF DIFFERENT PERSONS INTO ONE PROCEEDING. THE PARTIES EACH AGREE TO FINALLY SETTLE ALL DISPUTES ONLY THROUGH ARBITRATION; PROVIDED, HOWEVER, THE SPONSOR SHALL BE ENTITLED TO SEEK INJUNCTIVE OR EQUITABLE RELIEF IN THE STATE AND FEDERAL COURTS LOCATED IN OR HAVING JURISDICTION OVER COOK COUNTY, ILLINOIS, AND ANY OTHER COURT WITH JURISDICTION OVER THE PARTIES. IN ARBITRATION, THERE IS NO JUDGE OR JURY AND REVIEW IS LIMITED. THE ARBITRATOR’S DECISION AND AWARD IS FINAL AND BINDING, WITH LIMITED EXCEPTIONS, AND JUDGMENT ON THE AWARD MAY BE ENTERED IN ANY COURT WITH JURISDICTION. THE PARTIES AGREE THAT, EXCEPT AS SET FORTH ABOVE, ANY CLAIM, SUIT, ACTION OR PROCEEDING ARISING OUT OF OR RELATING TO THIS PROMOTION WILL BE RESOLVED SOLELY BY BINDING ARBITRATION BEFORE A SOLE ARBITRATOR UNDER THE STREAMLINED ARBITRATION RULES & PROCEDURES OF JAMS INC. (“JAMS”) OR ANY SUCCESSOR TO JAMS. IN THE EVENT JAMS IS UNWILLING OR UNABLE TO SET A HEARING DATE WITHIN FOURTEEN (14) DAYS OF THE FILING OF A “DEMAND FOR ARBITRATION,” THEN EITHER PARTY CAN ELECT TO HAVE THE ARBITRATION ADMINISTERED BY ANOTHER MUTUALLY AGREEABLE ARBITRATION ADMINISTRATION SERVICE WHO WILL HEAR THE CASE. IF AN IN-PERSON HEARING IS REQUIRED, THEN IT MAY BE HELD IN YOUR HOMETOWN AREA. THE FEDERAL OR STATE LAW THAT APPLIES TO THESE OFFICIAL RULES WILL ALSO APPLY DURING THE ARBITRATION. DISPUTES WILL BE ARBITRATED ONLY ON AN INDIVIDUAL BASIS AND WILL NOT BE CONSOLIDATED WITH ANY OTHER PROCEEDINGS THAT INVOLVE ANY CLAIMS OR CONTROVERSY OF ANOTHER PARTY, INCLUDING ANY CLASS ACTIONS OR CLASS ARBITRATIONS; PROVIDED, HOWEVER, IF FOR ANY REASON ANY COURT OR ARBITRATOR HOLDS THAT THIS RESTRICTION IS UNCONSCIONABLE OR UNENFORCEABLE, THEN THE AGREEMENT TO ARBITRATE DOES NOT APPLY AND THE DISPUTE MUST BE BROUGHT IN A COURT OF COMPETENT JURISDICTION IN COOK COUNTY, ILLINOIS. SPONSOR AGREES TO PAY THE ADMINISTRATIVE AND ARBITRATOR’S FEES IN ORDER TO CONDUCT THE ARBITRATION (BUT SPECIFICALLY EXCLUDING ANY TRAVEL OR OTHER COSTS OF ENTRANT TO ATTEND THE ARBITRATION HEARING). EITHER PARTY MAY, NOTWITHSTANDING THIS PROVISION, BRING QUALIFYING CLAIMS IN SMALL CLAIMS COURT. IN NO EVENT WILL YOU SEEK OR BE ENTITLED TO RESCISSION, INJUNCTIVE OR OTHER EQUITABLE RELIEF OR TO ENJOIN OR RESTRAIN THE OPERATION OR EXPLOITATION OF THE SWEEPSTAKES. Further, in any such dispute, under no circumstances will you be permitted or entitled to obtain awards for, and hereby waive all rights to claim, incidental or consequential damages. The prior limitation on damages is not intended to limit the Released Parties’ obligation (if any) to pay prevailing party costs or fees if recoverable pursuant to applicable law. WINNERS LIST/OFFICIAL RULES: To find out who won, individuals should print their name and address on a 3″x5″ card, and mail it in an envelope (first-class, postage-paid) to: Wilton Digital Marketing, Wilton Candy Melts Photo Sweepstakes Winners, 535 Diehl Road, Naperville, , IL 60563. Requests for winner information must be received no later than three (3) months after the Sweepstakes Period. For a copy of these Official Rules, during the Sweepstakes Period, visit www.wilton.com/candymeltsforyou. SPONSOR: Wilton Industries, Inc 535 Diehl Road, Suite 300, Naperville, IL 60563. Reference to third parties in connection with third-party websites, products, or services are for reference and identification purposes only and not intended to suggest endorsement, sponsorship or affiliation with Sponsor or the Sweepstakes. This Sweepstakes is in no way sponsored, endorsed, administered by, or associated with Facebook or Instagram.